As a business professional, I prefer a business backpack to the more student-oriented styles. Business backpacks separate themselves from the generic backpacks by being functional and helping me stay organized. I prefer them because they don’t look like my teenage son’s room at the end of the day. This Top 10 chart helps make the decision-making process easier. Everyone has his or her most important criteria, whether it is price, brand name, or style. Using this chart provides you with the most important facts at a glance. Once you have made your choice, you can follow the link to read customer reviews. One of the greatest benefits to choosing a business backpack is it is designed to help you get and stay organized. I do not have the time to spend an hour sorting through a pile of books, papers, and notes to find what I need. There is a safe and secure place to store my laptop or tablet, though choosing the right number of zippered pockets required a bit of thought. Another key feature of a business backpack is the ease of carrying it around. While a briefcase may be acceptable for some people, I put my laptop, folders, brown bag lunch, smartphone, keys, and water in my backpack. Not suitable for a briefcase. What’s more, toting it around is far easier whether I am walking downtown or walking up the hill to get into my car. From a safety perspective, both of my hands are free. I will admit I am a pack rat of sorts. That list of items I pack is on a normal day – think of them as basic necessities. But there is always extra room in there for the odd item. Once, this extra space averted a crisis at work. The particular business briefcase I have has a padded space next to the laptop, I guess for storing folders or notebooks. For me, this space is where I put my tablet, though I don’t always carry it with me. It is a tight fit, but there is enough padding that I am not worried about scrunching it. I work for a company of about 400 people. I had just packed up and left work, when about 10 minutes down the road I got a call from a tech telling me the data I uploaded was corrupted and they needed the data – now. Naturally, I was in the middle of Nightmare Traffic Jam – the latest version. I got off at the next exit and fired up my laptop to see the Blue Screen with all those hexadecimal numbers. That day I had my tablet, so squeezed it out of the backpack and successfully sent the data file – uncorrupted – to the company. The file they needed “now” was the payroll data for all 400 people. Having a tablet is not the same as having a tablet with you. The question many people ask is what should someone who is considering buying a business backpack look for. As I said earlier, it took me a bit of time to determine the optimum number of zippered pockets. I prefer zippers because things don’t fall out or get mixed up. Everything stays in the place you put it. For me, that is in the top five list of important features to have. The amount of storage space is another consideration, but if you need a lot of space then you need to keep in mind that you also will be carrying more weight. The backpack might be light, and sturdy, but the goal is to be organized and make your life easier, not send you to an orthopedist. Some business backpacks offer “workstations” – places where you can put your keys, cell phone, pens, and all those small items that would otherwise end up on the bottom of an ordinary backpack. Personally, I do not use them, but many people find them an indispensible feature of a business backpack. They keep you organized and can act as a reminder every work morning to be sure you walk out the door with the basic necessities. Tip: The workstation should not be overcrowded. Too much in one place is the same as disorganization. Padded shoulder straps are often standard, especially on the larger backpacks. But sometimes they can make carrying the backpack easier if you are slinging it over one shoulder. Unpadded straps can slide down and off of your shoulder, making you regret your purchase. Finally, maintenance is more of an aesthetic issue, but worth considering. I include ease of cleaning and durability in this category. I want my backpack to look worn but not ragged after a year or two of regular use, and that is made easier by being able to clean the material with a damp cloth. Of course, there are many business backpacks and messenger bags that offer most or all of these key features, so the next question is how you determine what backpack has the best features or combination of features. The first, and most obvious, piece of advice is to shop around. I dislike going to a bricks and mortar retail store. It just takes too much time. Driving there, finding a park, standing around in line… I’m far to busy for that. When I’m not busy, I’ve got more enjoyable things to do. My solution? I look online. Sure, you can’t actually hold the product until you receive it, but Amazon.com offers a great return policy. 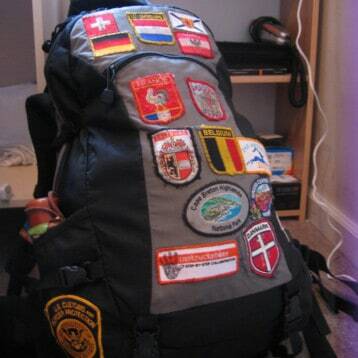 As far as maintenance, the material the backpack is made of is critical. Polyester and nylon are the most common materials and in most cases will be more than sufficient to meet your maintenance requirements. There are a few reasonably priced leather backpacks, but choosing this type should be done with care. Worn leather looks… well… worn. Extra time will likely be spent keeping the leather from drying and cracking. But the upside to this choice is it looks much better than most of the synthetic materials, letting you make a personal statement. Finally, while money isn’t everything, it can separate the best from the good. But remember that your choice needs to be the one that has the most complete set of features you will need. You may get more functionality with a more expensive backpack but that is not always the case. One consistent compliment this backpack gets is how slim its overall size is. At the same time, the 15-inch notebook pouch can fit a 17-inch laptop. It’s sleek look gives its user a professional appearance. The trade-off you make here is the slim design limits you to primarily the basic necessities: laptop, folders, etc. It does not have a place to carry a water bottle. It weighs in at a very comfortable 2 pounds and is made of a polyester material. While lightweight, the exterior padding is both comfortable and durable. Click here to look at prices on Amazon and find the best deal on this backpack. Their claim is this backpack has a pouch that can fit a 16 notebook. Some think this is a slight exaggeration. Despite this minor criticism, the business backpack has an outstanding workstation area for your morning before-I-leave-the-house inventory checklist. If space is a key consideration you may want to look elsewhere. It’s dimensions of 13 x 3.9 x 16.8 inches is smallish for those who want to pack a lunch beyond a single sandwich. The denier nylon material is both durable and comfortable. Its design is intended for maximum comfort, including well-padded shoulder straps. This is the only leather business backpack of the group reviewed. So it is pricier than the other backpacks, but not by much. Measuring in at 13 inches wide and 17 inches high, it will hold a 15.6 inch laptop. The quality of the leather is high and it is designed for heavy duty use, such as international travel. However, it is important to note that there is a mesh backing to allow your back to breathe when wearing it. For organizational purposes, the interior has enough pockets to efficiently manage navigating through the various airport security stations. Case Logic is known for its efficiently designed storage media, and this backpack is no exception. However, its focus seems to be on providing enough compartments space for your laptop and tablet, along with a number of accessories needed to keep you in work mode. But the lack of non-computer related compartments may have some buyers looking elsewhere. Once you pack your laptop and tablet, there is only a zippered mesh pocket for your smaller items, and the slot for the tablet does not appear to prevent the device from sliding out. The understated, minimalistic design makes it perfect for execs who have a strong requirement to carry their technology with them. At under $50 and available in an array of colors, this messenger bag has a hoist of features that makes it one of the best to consider. Measuring in at 4 x 9 x 12 inches, this single shoulder strap bag may not strictly qualify as a backpack, but has all the features of one – save for the dedicated laptop or tablet slot. But it does have an excellent workstation area and is roomy enough for most anything you would want to tote to work. Its sturdy nylon construction makes it a great choice for international travelers. Click here to look at prices on Amazon and find the best deal on this messenger bag.